One of India's greatest batsmen plied his trade at the no. 3 position. In world cricket, the role of the No. 3 batsman cannot be overstated. Acting as the bedrock between the openers and the middle order, the batsman is tasked with accumulation that tires opposition bowlers. 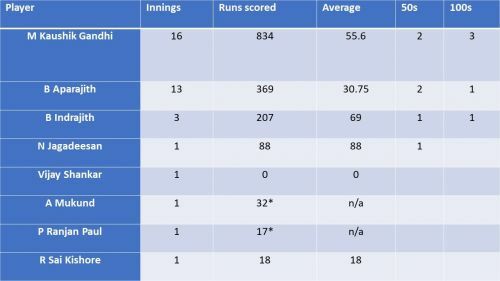 While the roles may be different today in the limited overs set-up of various international, domestic and franchise teams, it has been quite straightforward over the years in the longer format – solid cricketers who know their techniques well and can grind it out for long hours. 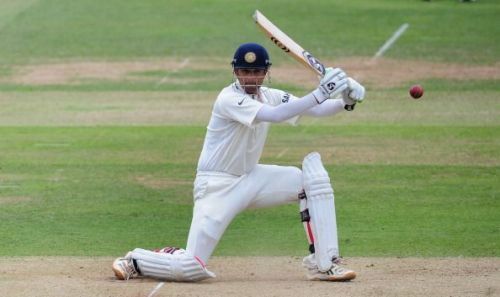 Sample the top three run-getters in international cricket batting at 3 and one knows how instrumental they have been to their teams’ performances – Kumar Sangakkara, Rahul Dravid, and Ricky Ponting. Tamil Nadu has had a second poor Ranji season in succession. It had so happened that only two seasons ago, they found a renewed three-pronged medium pace bowling attack with the average age being 24, and an accumulator who scored daddy hundreds a la Subramaniam Badrinath. In the group stage, Tamil Nadu completed two large victories, lost in just one game and gained a first-innings lead in four matches. M Kaushik Gandhi had a breakthrough season. The lynchpin of the batting order at number 3, he had three 150+ scores, single-handedly giving Tamil Nadu a first innings lead in an important fixture against Punjab by scoring over 46% of the team’s runs in the first innings. Playing patiently and unfailingly, he made batting easy for the elegant Indrajith and the attacking Dinesh Karthik to score freely and heavily. Quietly, he eased Tamil Nadu into the semi-finals. The 2017-18 season saw a chop-and-change pattern of No. 3 batting opportunities in an extremely shortened season of just six full games. While Kaushik Gandhi deservedly got the first three games but failed on most occasions, the team management tried various others in that role, without giving opportunities to either Indrajith or Aparajith, who had batted there in the earlier season. 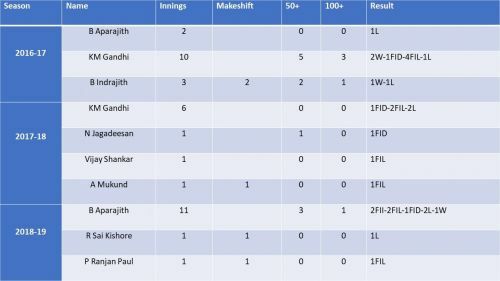 While the 50-run mark was breached 7 out of 15 times in the 2016-17 season, there was only a solitary fifty (from N Jagadeesan) in 9 innings this season from this position. Aparajith primarily batted in the lower middle-order and was in striking form, scoring 3 half centuries and 2 centuries in 7 innings, although his highest score was 109*, none of these knocks coming in a winning cause. The frequent batting order changes and the availability of senior Indian cricketers saw players in no settled position throughout the season, being a part reason for Tamil Nadu’s off-color show in 2017-18. The new season in 2018-19 guaranteed eight matches to Tamil Nadu in the group stage. The state was also lucky enough to host five of those matches, a luxury not many other teams enjoyed. However, there were a few pre-season hiccups and failures. The first-team players usually get long-format match practice through the first division games and the Buchi Babu tournament matches, both of which did not happen this season due to an early start to the Ranji Trophy. The players had to contend with playing about 10 games of the VAP Memorial Trophy, which is the 50-over format of first-division cricket. Added to this, early Ranji season in Tamil Nadu sees rain play a role in most home games, and this affected the result of the first two matches that were hosted in Tamil Nadu. Thirdly, the selection panel picked four players who are most comfortable playing in the positions of number 3 or number 4 – Baba Indrajith as the new skipper, Baba Aparajith, B Anirudh Sita Ram and M Kaushik Gandhi. Of these, at least two players needed to play out of position in the lower middle order. Kaushik Gandhi, who was the top scorer in the VAP Memorial Trophy, did not get the first game. B Anirudh, who was the third highest scorer, batted at an unfamiliar No. 6 position. It was to the Tamil Nadu management’s credit that the number 3 position was virtually untouched and unchanged throughout the tournament, but the only question was whether they had the right person in place, given that the player who was Tamil Nadu’s shining light two seasons ago in the same role batted out of position in the few matches he got. The statistics of the No. 3 batter reflect the team’s performances – 3 scores of 50 plus, with a sole century in 13 innings, thus breaching the 50-run mark just once in every four innings. Compared to 2016-17, when this was achieved nearly once in every two innings, the effectiveness of the No. 3 translating into the team’s success is pretty evident. For the teams that qualified for the quarter-finals of the Ranji Trophy this year, the No. 3 has played a significant role in the fortunes of their respective sides. While Kerala was an anomaly, with no one batsman as a stand-out, Uttarakhand, Gujarat and Saurashtra saw their openers and middle-order step up at various occasions, with Gujarat skipper P Panchal the standout opener of the tournament. For the other four teams, their respective No. 3 batsmen have been the fulcrum of their batting successes. KV Siddharth, playing his maiden season, was batting at No. 4 and No. 5 for much of the first half before moving up the order, while for Uttar Pradesh, the duties were shared equally by Priyam Garg and Mohammed Saif. 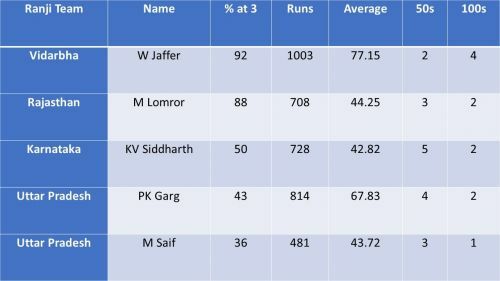 In dissecting a cause for Tamil Nadu's barren run for two years, a few bright spots emerge in this season – R Sai Kishore who has finally broken out of the TNPL and limited-overs performer shadow to put in three dominating performances, the exact way he does in the first division games in Chennai; M Shahrukh Khan, who now looks a more confident and much needed middle and lower middle order batsman playing two doughty innings; and an upcoming star in Pradosh Ranjan Paul, who could well be the answer to the No. 3 position if Tamil Nadu is looking at the long-term. If only the players apply the steel and the fighting spirit of Vinay Kumar the way he did in the Ranji semi-finals, where he battled hard to win Karnataka a tough game after having a poor season, Tamil Nadu will see more success follow its footsteps.